Over 600 athletes from more than 50 countries competed in 29 separate divisions for this amazing international festival of strength and fitness! Over 600 athletes from more than 50 countries competed in 29 separate divisions for this amazing international festival of bodybuilding, strength and fitness! This is our second Amateur offering in many years, and we are very proud to give the fans almost NINE HOURS of coverage in this Double-DVD set featuring Men’s Bodybuilding, the new Men’s Classic Bodybuilding, Women’s Bodybuilding, Women’s Fitness, Women’s Figure, Women’s Bikini, and highlights (the final 15 athletes) of Masters Figure. 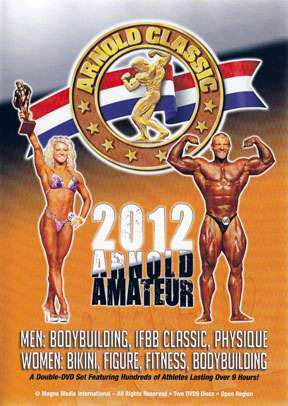 This DVD set of the 2012 Arnold Amateur is a real blockbuster! Posing, comparisons, awards, pageantry – it’s all here and the results are sensational! Plus the DVD cover can be removed and the COMPLETE RESULTS are printed on the reverse side! COMPLETE ARNOLD CLASSIC EVENT – DVD COLLECTION & RESULTS.